SEWASP - Interested in Volunteering? Note: original completed application must be submitted by mail) or turned in at a training. Forms must be completed in blue or black ink. Dry land sessions - The Quality Inn and Suites (2921 O'Leary Lane, East Troy, WI) - Note: the location is the same, but the hotel name has changed. Volunteers are encouraged to attend as many as possible. 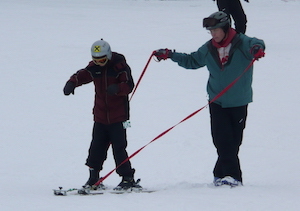 On-snow training at Alpine Valley Resort (RSVP for on-snow training) - All Volunteers are welcome to join any or all! Returning blue square volunteers are required to attend at least one of these sessions so they can be checked off prior to teaching. Please email the Program Coordinator by November 16th, 2018 with the program dates you can commit to.